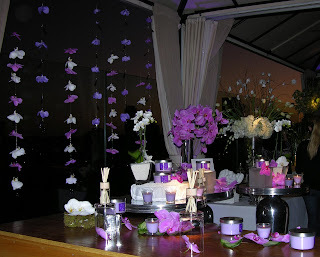 Judging room from these pictures and narrative of last night's pop-up boutique at the Thompson Hotel Rooftop Bar and Lounge on Wilshire Boulevard in Beverly Hills, California, The Fragrance Collection by Glade event was all about elegance. Sponsored by Glade, the gala was staged by The Buzz Girls, along with a camera crew shooting for Angeleno Magazine. As a former PR executive myself, now working primarily as a Mommy Blogger, I'd be remiss if I didn't acknowledge the behind the scenes Chicago and Los Angeles teams from Edelman, the public relations agency selected to lead this event: your professionalism was front and center, down to the last detail. The poolside party on Thompson Hotel's rooftop is shown above. The stage was indeed set upon arrival and everyone's hard work in organizing this was apparent. 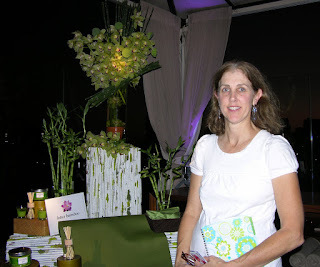 Joining as my guest for the Glade get-together was Laura Seitz whom I met when I recently did a product review spotlighting her one-of-a-kind USA-made Cheeky Quilts. I think you'll agree that Laura, who gets full credit for the photography associated with this post, took some wonderful shots that captured the event's essence beautifully. My party partner for this girls' night out and I, both A-personality, creative types, worked primarily in public relations, writing, and marketing in past lives. So, I speak with some authority when I say that we both appreciated the artistic attention to detail from the beginning to end of the evening. With a 360 degree view backdrop of the city lights of Beverly Hills and Los Angeles beyond, plus Southern California's perfect weather, the merchandising and ambiance literally broke through the ceiling of this classic hotel in the prestigious 90212 zip code. I won't go into a breakdown here on the many special touches I noticed that succeeded in eliciting a range of emotions and moods. What I will say is that six different scent combinations in The Fragrance Collection by Glade were on display: Sheer White Cotton, Currants and Acai, Lotus Bamboo, Jasmine and Wild Orchid, Pomegranate and Cranberries, and Fresh Pine and Cedar. The latter three scents are the new to the existing home fragrance line, with the last two specially formulated for the upcoming holiday season. A rather unique detailed and separate product review on the Glade's full line of candles and reed diffusers will be forthcoming on my blog. These will feature interviews with, and impressions from my in-house focus group: including my hubbie and kids, after they've each put the entire collection's nine-piece lineup of sensational smells to the test for themselves. Each scent experience had its own smelling and viewing alcove around the pool as its centerpiece and all staged areas were masterfully done. Just to give you an idea of how several of the varieties were presented, here are a couple of vignettes about some of my favorite scent arrangements. The presentation table that spelled the most luxe to me was, without a doubt, Currants and Acai, which was one of the last stops on the mini-circuit at this boutique. The deep red of royalty of this candle style was set on fire here with red roses, similarly-hued lip gloss and nail polish juxtaposed among the products. Another area I loved was the Sheer White Cotton display, which seemed quintessentially California. 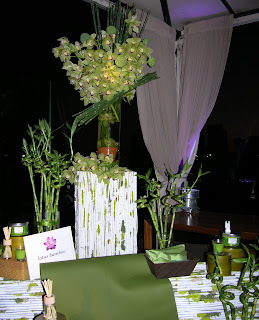 Glade's clean, fruit fresh scent with woody notes like freesia and lime, were paired here with all white flower arrangements such as tulips and hydrangeas. Hemp baskets generously filled with lined up rolled white terry hand towels accessorized this station, setting off the tasty array of beckoning platters laden with decadent white chocolate-covered fresh strawberries and fluffy white-as-clouds meringue cookies beside it. How nice to have some time out of the house, away from my kids for a few hours. Thanks to my dear hubbie for serving the dinner I almost forgot to make for my family before running off to this party. Surrounded by beautiful merchandise served up pool-side, natural moonlight shining above, just-perfect air temperature, and not-too-loud background music, this is my idea of a relaxing evening out and a fine example showing that mixing business and pleasure can be fun. Just imagine: really nice people mingling while eating crunchy arugula sushi and sipping champagne garnished with jewel-like pomegranate seeds served in sparkling tall fluted stems. Surrounded by all that, in such a elegant, yet peaceful setting, can you think of an evening that could be more splendid? More on Glade's The Fragrance Collection Soon! Watch for additional Mommy Blog Expert posts on Glade's home fragrance line. The next post in this topic will give the 411 on the lovely put-together goody bags given to those of us who were lucky enough to be invited. These parting gifts were simply the icing on the pomegranate topped cupcakes (the ones that I passed up after reaching my daily calorie intake limit) that were luciously displayed alongside the Pomegranate and Cranberries Fragrance Collection by Glade products. That will be followed by a Product Review highlighting the entire collection. As always, MommyBlogExpert encourages your Comment Posts! It was great meeting you and fun schmoozing. So glad you like the first story I've done about the Fragrance Collection by Glade event. I have several other pieces coming up on their great smelling products so stay tuned. BTW which scent was your favorite? I just loved the Pomegranate and Cranberries.